Bowl of hot oatmeal is a delightful breakfast for a cold morning that has been practiced for generations, and most people know that oats are an ideal food for a healthy heart and that it influences the lowering of cholesterol. However, the most important ingredients in oats are right in the outer layer, which is called bran. Oat bran unlike flakes has a high content of unique soluble fibre called beta-glycan, which has remarkable health properties, and makes this an ideal healthy food for weight loss. Oat bran is used exclusively to feed cattle, but today more and more is applied in daily human diet. It is finally recognized as one of the most important ingredients in a healthy diet. In this article, learn about its many health qualities and learn why it is important for good health. Does it contain calories and how many? In one hundred grams of oat bran there is a total of 246 calories, which is not really a lot, because it contains ingredients that are much more important for the proper functioning of your body. Full bowl of oat bran contains about 50 % more valuable fibre than the same amount of oatmeal, which makes oat bran more effective in lowering cholesterol, triglycerides, and reduce weight, but because of this fact it became a part of menus of many diets today. While you are on your way to weight loss, you will experience other advantages of high fibre foods. Consuming beta glycan reduces the risk factor of diabetes, accelerates the process of wound healing, and has a beneficial effect on your heart. Oat bran reduces blood cholesterol levels and thereby reduces the risk of heart attack. The soluble fibre in oat bran reduced the density levels of lipoproteins. Except that it is low in calories, there are two combining properties that make oat bran excellent for weight loss. First, the high fibre content quickly saturates you. As soon as you eat, fibres from oat bran absorb saliva, then expand in the stomach and absorb fluids, twenty five times its volume. The feeling of satiety lasts longer, so that the breaks between meals are longer. Another way that oat bran has a slimming effect is biologically unique. It blocks the absorption of calories in the intestines. Here is how they do it; when you eat food, it is broken down into its constituent components fatty acids, carbohydrates (glucose) and amino acids (building blocks of protein). Calories from these components are then absorbed into the body through intestines. When you eat oat bran, they are mixed with water to form a mixture in the organism called bolus. This mixture extremely well absorbs some of the decomposed substances, and then it gets attacked by gastric juices, which convert it to a pulp. This pulp becomes a part of the stool, which is softened and gains in size, and therefore ejects the calories from the body. If you have any digestive problems - constipation, haemorrhoids and the like, be sure to include it in your diet. The pulp contains amino acids, fats, glucose, and all this is eliminated through the stool, without a chance to be absorbed into the body. This process slows the assimilation of sugar (glucose), and removes the excess calories from the body, keeping blood sugar levels low and stable. We will teach you how to easily prepare and serve it in different ways, for whichever of them you choose, there will be no mistakes. You will do a lot for your digestive tract, facilitates and speeds up digestion, you will get a feeling of satiety, which helps if you are planning a long-term diet. 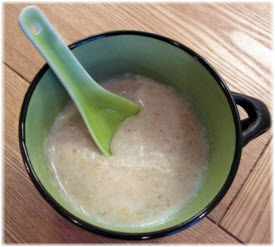 Add a full tablespoon or two of oat bran per cup of yogurt, cheese or yogurt, stir and eat. You will layer the walls of the stomach and facilitate digestion. Add a spoonful to omelette. You can prepare oat bran with pork, chicken and eggplant. You can add it to the favourite seasonal salads. Use them instead of breadcrumbs when cooking steak, meatballs or patties. Stir them into the soup or stew. Try to use oat bran instead of flour for cakes or pancakes. Preheat the oven to 220 degrees and prepare a mould for muffins. Stir the mix in the pot then add the milk, eggs, honey and oil. Stir until combined and then fill the moulds. Bake for 14-17 minutes, depending on the strength of the heater, until muffins become golden brown. (If you want you can add fruit of your choice, frozen banana or blueberries). You do not like buying bread, you feel that it is full of additives and that is unhealthy? We have a solution – make an oat bread. Whip egg whites, especially the other ingredients. Slowly mix egg whites with the second mixture, and bake for 20 minutes at 200 degrees Fahrenheit until it is finished. Since oat bran is an excellent choice for regulation of digestion, always make this bread, problems with constipation will disappear. Finely chop the chicken, (if you use chicken, fry briefly). Separate the egg white and yolk, egg yolk mix with cheese (or yogurt), add oat bran (you can pre-grind it), spices, and chicken and mix everything. Egg white whip until you get a solid foam. Combine the two mixtures slowly, and pour into moulds for muffins. Bake for twenty minutes at 200 degrees until they are nice golden brown. Oat bran can be purchased in health food stores or in major shopping centres. Since they contain a small amount of natural fats, they are subjected to deterioration. We suggest that you search for a product that is in a tightly closed container. If you turn to buying in bulk, we recommend that you buy it from a store that has a lot of traffic to make sure that the product is fresh, similar advice is applied for flaxseed. To verify that the oat bran is fresh, check for lumps, it is a sign that they picked up moisture, and then do not take them. You can also check their scent, it should be pleasant - mildly nutty, if you think it is unpleasant or slightly mouldy, then avoid it because it is certainly no longer fresh. Since oat bran is quite sensitive, and perishable, make sure that you keep them in a tightly closed container, and store them in a cold and dark place. To prolong their shelf life put them in the freezer, in a tightly closed container. You can cook and use it right out of the freezer, it is not necessary to defrost oat bran because it contains very little fluid, so it will not freeze, but will only remain fresh and will not spoil. If for some reason you do not like it, our recommendation is to try wheat bran, which is also very effective and has many health benefits, especially for digestion.